The end-of-year transition from fall festivities in October and November to the holiday season in December means it’s time to trade in pumpkin spice for classic gingerbread baked into cookies, well-decorated men (and women), and cozy houses held together with icing. 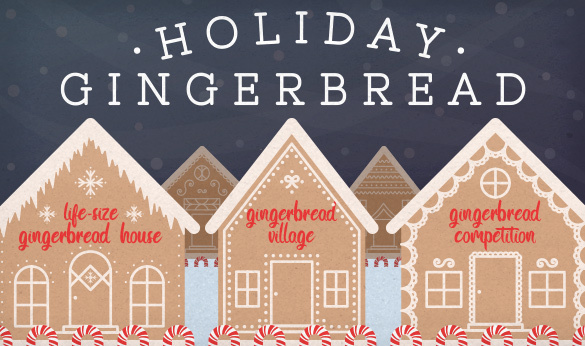 Although the history of gingerbread can be traced back to ancient China and Greece, and gingerbread houses may owe their popularity to a not-so-sweet fairy tale, constructing and decorating gingerbread buildings is a treasured (and tasty) way for many Americans to celebrate the holidays. With gingerbread competitions, replicas of local landmarks, and life-size gingerbread installations, consumers and businesses across the country can enjoy this festive holiday tradition all month long. Keep reading to learn more about some of the cheerful creations on display this year, from a colorful recreation of San Francisco’s rowhouses to gingerbread competitions for all ages. Waterbar, a seafood restaurant located on San Francisco’s Embarcadero roadway, has made headlines for several years thanks to its pastry team’s faithful recreations of the city’s landmarks. This year, the restaurant constructed a replica of San Francisco’s painted ladies, the nickname given to its many iconic Victorian rowhouses. The pink, blue, and purple gingerbread houses were completed with interior lighting, delicate exterior details, and bay windows. In previous years, Waterbar’s sugar specialists have created the Embarcadero waterfront to celebrate its 10th anniversary in 2017, brought the Ferry Building to life in 2016 (with the help of 61 cups of flour and 18 pounds of powdered sugar, among other ingredients), and constructed the Palace of Fine Arts – topped with a domed roof – in 2015. Located just a couple of miles away in San Francisco’s Nob Hill neighborhood, The Fairmont has long enchanted guests with its life-size gingerbread house. Visitors in previous years have been treated to a two-story Victorian home featuring hundreds of charming details, from Santa climbing in the chimney to nutcrackers guarding the windows. This year, the luxury hotel has spiced up its display with a functional dining room that can seat 10 guests. The sweet space can be booked for afternoon tea, dinner, and special occasions; the hotel also offers a gingerbread house proposal package. According to The Fairmont, it took 6,000 gingerbread bricks, 3,300 pounds of royal icing, 1,650 pounds of candy, and 1,147 hours to make and assemble the 25-foot-tall gingerbread house. The National Gingerbread House Competition™ hosted at Grove Park Inn in Asheville, N.C., may be the country’s most famous, but competitive events held in towns across the United States help local businesses spread holiday cheer and engage with their communities. In New Bern, a North Carolina town still recovering from extensive flooding and other damage caused by Hurricane Florence, this year’s gingerbread house contest has helped bring additional traffic to downtown businesses. “This fall, despite the devastation wrought by Florence – including a shortage of working kitchens – we wanted the contest to go forward in order to help bring the crowds and smiles back downtown and to restore a sense of normalcy,” says Mickey Miller, executive director of the New Bern Historical Society. The NBHS organized the event for the first time last year. The theme for 2018’s contest – “Historic New Bern Christmas” – inspired residents to recreate some of the town’s landmark buildings. In addition to winners selected by a panel of judges, locals were able to vote for the “People’s Choice Award” winner and view the gingerbread buildings displayed in the windows of 13 storefronts. To give Western New Yorkers the full holiday experience, pastry chefs and students at the Niagara Falls Culinary Institute created a life-size gingerbread village dubbed Gingerbread Wonderland. Although the majority of the village is a 3D facade, it includes a functional room furnished with Santa’s chair and other decorations where kids can meet Mr. Claus himself. In WIVB news coverage of the masterpiece, NFCI staff revealed that work on their annual gingerbread house begins in September and estimated that the fully assembled structure, which is built on wooden framework, requires thousands of gingerbread bricks, around 1,000 pounds of royal icing, and countless hours of work by students and staff members. Students, amateurs, and industry professionals were also invited to participate in a gingerbread house competition, which offered divisions for children, high school students, college students, amateur bakers, and professional bakers. The Institute’s holiday fun doesn’t stop there, though, as they also host kids’ crafts, face painting, cookie decorating, and other holiday activities all season long.